Applications are invited for 100 slots and 05 passage grants for Selection Year 2018-19 under National Overseas Scholarship Scheme for Scheduled Castes, Denotified Nomadic and Semi-Nomadic Tribes, Landless Agricultural Labourers and Traditional Artisans. The award will be admissible from 2018-19 and no past claims will be entertained. The Scheme provides financial assistance to the finally selected candidates for pursuing Master level courses and Ph.D abroad in the accredited Institutions/University by an authorized body of that country. 1. For Ph.D Students must have 55% marks or equivalent grade in relevant Masters’ Degree. For Masters’ Degree students have 55% marks or equivalent grade in relevant Bachelors’ Degree. 2. Applicants should have below 35 (Thirty Five) years, as on First April of the selection year. 4. Not more than two children of the same parents/guardians will be eligible. Please follow the below steps to apply for the Central Sector Scheme of National Overseas Scholarship for SC Students. 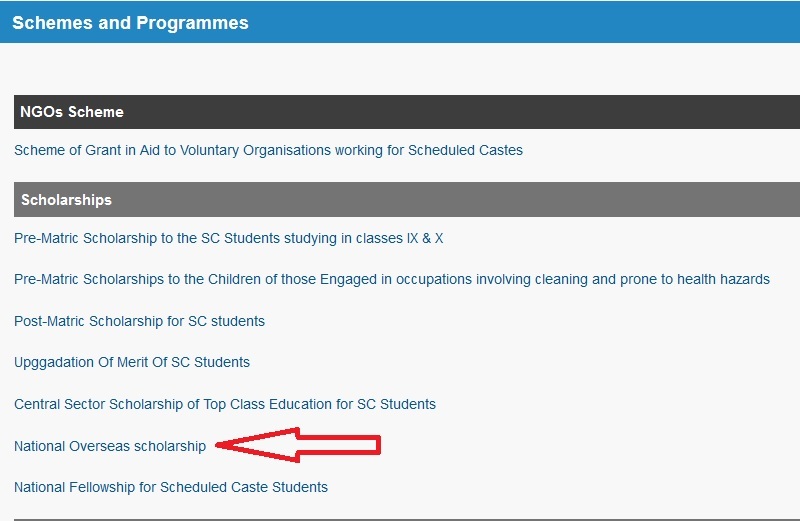 Step 2 : Then select the ‘Scheduled Caste Welfare’ under ‘Important Links’ section and Click Schemes and Programmes link. 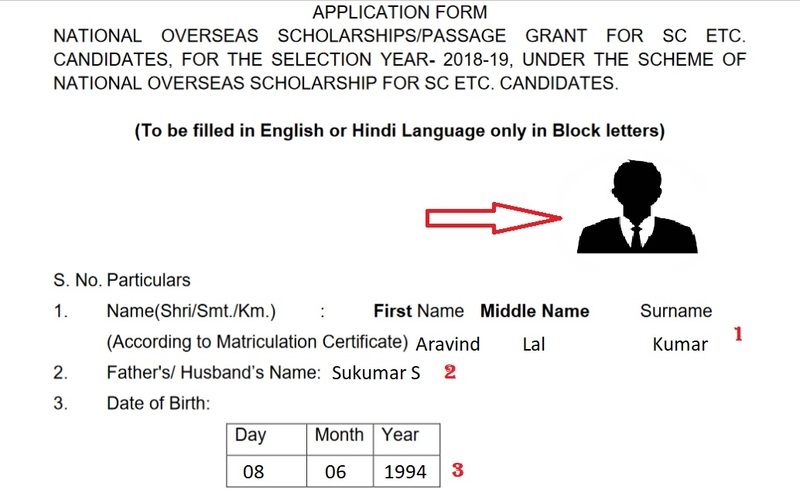 Step 3 : After that, select National Overseas Scholarship link under the ‘Scholarship’ tab. Step 4 : Read the terms & conditions carefully and download the Application Form at the bottom of the page or you can directly download it from the below mentioned PDF. Step 5 : Fill the Application Form with the required details and paste your recently taken photo in the Application Form. (c) Income certificate in the prescribed format. (b) Self Attested copy of the letter of the award. The annual maintenance allowance of US Dollars 15400/- (Fifteen Thousand four hundred) has been prescribed for all levels of courses covered under the Scheme. The annual maintenance allowance of 9900/- (Nine Thousand nine hundred) Great Britain Pound (GBP) has been prescribed. Besides the above, there is provision for Contingency allowance, incidental journey allowance, poll tax, Visa fee, fees and medical insurance premium, air passage will also be provided. ** Students will be considered for the award on first come and first serve basis. ** In case of tie between two or more candidates the following selection procedure will be followed. a) First, available unfilled slots earmarked for women candidates will be filled up from amongst eligible candidates. Applications received up to 31st March of the financial year (2018-19) will be considered for grant of award/assurance of award for the Selection Year 2018-19. I want to send my application form, can you please send me the email ID?